Choosing 70th birthday wishes is not as easy as it may look. Turning 70 is a major and, for some people, an emotionally tricky milestone to reach. Some soon-to-be 70 year olds dread everything about turning 70, from the likelihood of more wrinkles on their face to the onslaught of new aches and pains that never seem to go away. Then, you have the type of seventysomethings who have chosen to grow older gracefully, treasuring the trail of memories (and wrinkles) they've forged and enjoyed over seven decades. Whether your 70-year-old birthday girl or boy sees the glass half empty or half full, you need to give him or her something to feel good about — he or she has certainly earned it. That's why great 70th birthday messages on this page celebrate this occasion with tender, loving care. 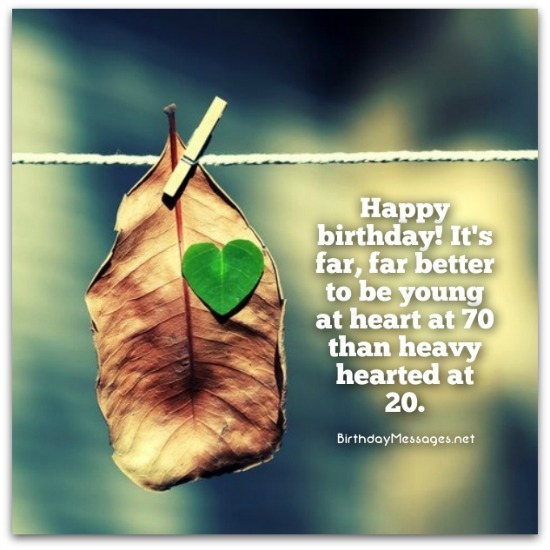 Turning 70 is a major milestone — joyous for some and emotionally challenging for others. Keep in mind that different types of 70 year olds require different kinds of birthday greetings. First, there are the "joyous" 70 year olds. These are individuals who are young at heart and, if they've won the gene pool lottery and are relatively healthy, consider the 70s the beginning of the best period in their lives (the so-called "first day for the rest of my life" crowd). 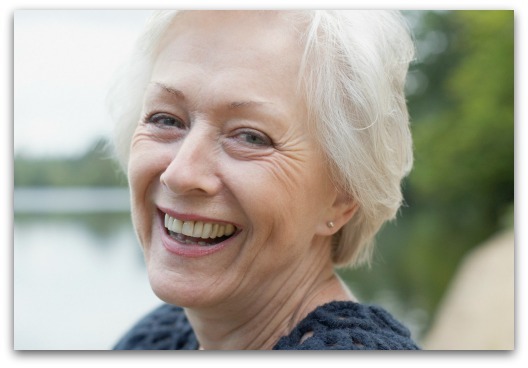 Accordingly, the "joyous" 70 year old would probably love to receive an inspirational birthday message (confirming their optimism about life), a funny birthday greeting (making fun of getting older), happy birthday wishes (generically pleasing for some), even a clever birthday message that exercise their mind — basically, any type of 70th birthday wishes, except the depressing kind. Because the other group (the "this is my final act" crowd) may suddenly realize (or stop denying) — sometime on, before or after their actual birthday — that they have reached the last quarter of their life, figuring out what message to pick for them can be difficult. Should it be philosophical? Inspirational? Funny? It depends on how "old" these 70 year olds feel. For the overly pessimistic faction of this group (the ones who feel very old all of a sudden), probably no message will be taken in the spirit it has been given, so just go the safe route and opt for a generic (plain "Happy Birthday") message or a sentimental (remember the good ole days) birthday greeting. For the most optimistic of this crowd (in other words, the least pessimistic), an inspirational, clever or sentimental message can snap them out of their funk. It can't hurt to try (the birthday boy or girl will at least appreciate the effort). Whatever you decide to do, make sure to browse through this section and, even if you find a message you remotely like, tailor it to your liking and the birthday boy or girl. Good luck! Happy 70th birthday! You deserve all the accolades you're getting and more. You've worn so many hats for so many people, for so long — without expecting anything in return. It's time you did! Happy 70th birthday! Think of this birthday message as a friendly welcome mat to your 70s — and the start of a new adventure in a new land with new promise. Happy 70th birthday! Now you're closer than ever to learning the meaning of life: you have to keep moving to keep moving! Hope all 24 hours of your 70th birthday are as memorable as the last 70 years have been for you. Happy 70th birthday! Don't be sad about your age. In dog years, you'd just be 10 years old. Truly beautiful 70 year olds are the picture of health, happiness and virtue. When we look at you, we are awed and comforted by your beauty. Happy 70th birthday! 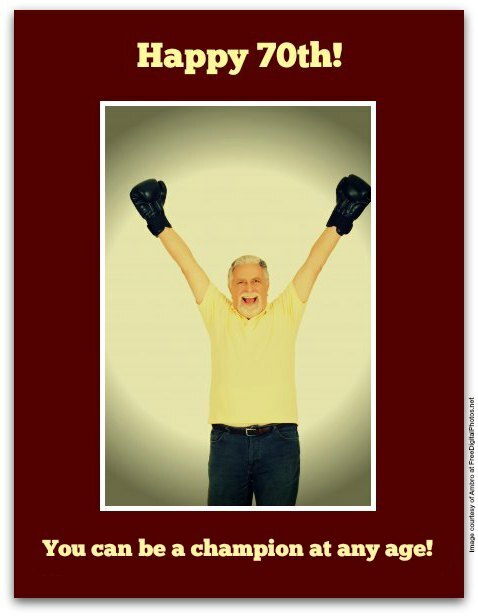 Celebrate your birthday exactly like you've lived the last 70 years — with joy, wonder and contentment. Happy 70th birthday. At 70, you deserve to look back to days of old and look forward to many New Years ahead! Happy 70th birthday! First of all, there's no such thing as your "average 70 year old." For a look at what it really means to be 70, click here to read a great article on the subject. It could make choosing 70th birthday wishes easier. Happy 70th birthday! With 70 candles on your birthday cake to blow out, you won't have to exercise your lungs for a month. Happy birthday! For 70 years, your dreams have fulfilled you. Now it's time to fulfill your dreams. Happy birthday to a 70 year old who could teach any 20, 30, 40, 50 or 60 year old what it means to be young at heart. Happy birthday! 70 really suits you! Can I wear your 70 year old suit? Happy birthday! At 70, you're still a regular fountain of youth. May your cup always runneth over! On your 70th special day, you deserve to savor every special second of it. Let's make it special together! Happy birthday! At 70, blowing out every candle on your birthday cake is not the problem — it's if you blow out all your dental work at the same time. You're not only the youngest 70 year old I know — you're the only 70 year old I know. Happy 70th birthday! "Keep it real" is the best advice any seasoned writer can give a beginner at writer. That's good advice because it takes into consideration one of the major motivators for writing: the reader. That's why I picked the birthday message below as my favorite on this page. What makes it real? This message shows the true depth of the sender's feelings for the 70-year-old recipient, without sounding phony about it. 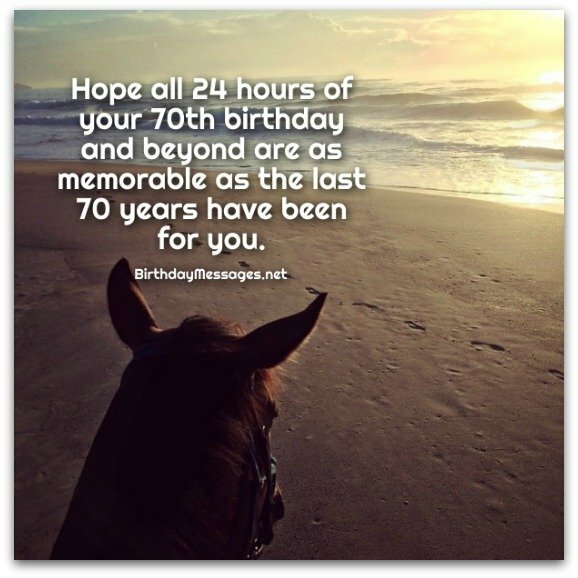 If I was 70, I would love to receive this birthday wish. It's so genuine. Happy birthday! It's a shame that everyone and everything that's 70 years old is nowhere near as loving, kind, wise, gentle and inspirational as you. But at least we have you.